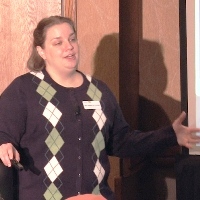 Dr. Ladan Mohammad Zadeh, DVM, DACVECC, explains fluid therapy. Useful to anyone wanting a review of the important aspects of fluid therapy and those wanting to tailor their fluid choices for their patients. 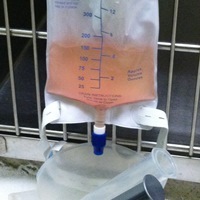 Fluid therapy is a topic that we all learned from day one in veterinary school. Although it is a fundamental part of many of our therapies, it is far from a basic concept. This review of fluid therapy will start with understanding fluid compartments, osmotic and oncotic pressures, review the fluid types available and the ‘when’ and ‘where’ of fluid therapy. Lastly, we will review certain common scenarios in general practice and the role of fluid therapy in those situations. Total body water (TBW) is comprised of 60% intracellular space and 40% extracellular space. The extracellular space is further divided into intravascular and interstitial (25% and 75% respectively). There is a minute amount of space accounted for in synovial, pericardial, pleural and peritoneal fluids. The major cations in the intracellular space are K+ and Mg++. The major anions are PO4- and protein. In contrast, the major cations in the extracellular space are Ca++ and Na+ and the major anions Cl- and HCO3-. The balance of fluid between the intravascular space and the interstitium is governed by hydrostatic and oncotic forces. And the balance of fluid between intracellular and extracellular compartments is governed by the osmotic effect of Na+. This is true because membranes are virtually impermeable to ions but allow water to move freely across membranes. Osmolality: A count of the total number of osmotically active particles in a mass of solution (mOsml/kg). Effective Osmole: Molecule that has the ability to exert an osmotic force, i.e. can cause water pull. Typically these particles are not freely moveable across membranes. These include Na+, K+, and Glucose. Ineffective Osmole: Molecules that do not exert an osmotic force. Usually these particles FREELY move across membranes. They include urea and HCO3-. Calculating a patient’s osmolality can help determine degree of intracellular dehydration. The higher the osmolality, the more water has shifted out of the intracellular space into the extracellular space. Severe hyperosmolality can lead to neurologic signs and weakness. It is easy to confuse the terms osmolality and tonicity. It is helpful to think in terms of tonicity representing the sodium content and osmolality representing all of the effective osmoles in a fluid. For example, 0.9% NaCl is both isotonic (154 mEq/L NaCl) and iso-osmolar (308 mOsm/L). Five percent dextrose in water, D5W, is hypotonic (0 mEq NaCl) but iso-osmolar (252 mOsm/L) because of the dextrose concentration. For IV solutions that are meant to be used over many hours to days, solutions must be iso-osmolar in order to decrease the risk of phlebitis. For short term infusions however, it is acceptable to infuse hyperosmolar solutions such as 7.5 % NaCl which is both hypertonic (1232 mEq Na/L) and hyperosmolar (2464 mOsm/L). Mannitol is unique because technically it is hypotonic, but is hyperosmolar (1098 mOsm/L) and does cause fluid shifts out of the intracellular and interstitial spaces. This is why it is primarily used to treat cerebral edema. Colloid osmotic pressure is the pressure exerted against the flow of water out of the intravascular space. Hydrostatic force can be seen as its opposite, that is, the pressure of water flow out of the intravascular space into the interstitium. Colloid osmotic pressure (COP) is synonymous with oncotic pressure. Albumin imparts 80% of the COP in the intravascular space. Thus, it is easy to understand how hypoalbuminemia and the associated drop in COP results in fluid shifts out of the intravascular space. Starling’s forces describe the effect of hydrostatic pressure and oncotic pressure on both the interstitial side and capillary side. It dictates the direction of water in or out of the plasma space. In arterial capillaries, the hydrostatic pressure is slightly greater than oncotic pressure, favoring filtration, or movement of the water into the interstitium. On the venous side, oncotic pressure is slightly higher favoring fluid movement into the plasma space. When you are deciding on a fluid therapy plan, it might be useful to pose the following questions: Is fluid therapy indicated? What type of fluid should be given? By what route should the fluid be given? How rapidly should fluid be given? How much fluid should be given? Assessing hydration is something we all do as part of our complete physical exam. Determining the level of dehydration in our patients is a combination of physical exam parameters (usually mucous membrane and skin tent), history of losses or lack of water intake, and lab parameters such as PCV/TS and urine specific gravity. Skin tent is not a reliable indicator of interstitial hydration in pediatric patients and geriatric patients. Levels of dehydration include: 5-6% mild, 7-10% moderate, and 10-12% severe. 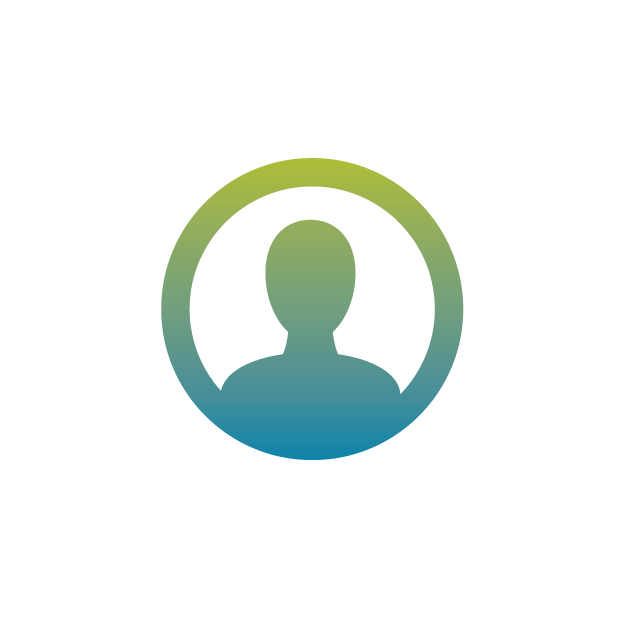 A patient is clinically moribund at a level of 15% dehydration. To answer the question of what type of fluid should be given, there are only a few major categories of fluid types to choose from. Crystalloids are solutions containing electrolyte and non-electrolyte solutes capable of entering all body fluid compartments. Within one hour of administration, 2/3 redistributes into the interstitium and 1/3 stays in the intravascular space. Isotonic fluids are meant for interstitial rehydration or maintenance. Hypotonic fluids target intracellular rehydration. And hypertonic fluids are meant for intravascular volume expansion or to create interstitial volume dehydration. Most crystalloids, other than 0.9% NaCl and 0.45% NaCl/2.5 % dextrose, are considered balanced solutions. A balanced solution is buffered, isotonic and contains electrolytes. Saline is an acidic fluid and when given in large volumes may exacerbate underlying acidosis or delay normalization of pH. Balanced crystalloids are buffered, making them more alkaline. Other terms that are used to describe crystalloids are replacement and maintenance. Replacement fluids contain an electrolyte profile similar to extracellular space (i.e., higher Na+ and less K+), while maintenance fluids have an electrolyte profile similar to intracellular space (i.e., lower Na+, higher K+). The advantages of a maintenance fluid type is that it decreases the Na+ load long term and decreases need for aggressive K+ supplementation. Indications for use of a maintenance fluid type would include chronic renal failure or rehydration of a dehydrated congestive heart failure patient. Colloids are solutions containing molecules greater than 30,000 kDa. Two-thirds stays in intravascular space and 1/3 redistributes. The half-life of synthetic colloids ranges from a few hours to a few days. Hetastarch, blood products, albumin, and Oxyglobin™ are all examples of colloids. They are generally used for oncotic support (e.g., hypoalbuminemia), or intravascular support (e.g., refractory hypotension). Six percent hydroxyethyl starches are the most common type of synthetic colloid available. The following table lists the most commonly used 6% hydroxyethyl starches, the base fluid and the molecular characteristics. The first number represents the average molecular weight of the particles in the solution. The second number represents the molar substitution of hydroxyethyl starch per glucose. To reduce intravascular hydrolysis of hydroxyethyl starch by amylase, the amylopectin is hydroyxyethylated most commonly at carbon position 6. The number of hydroxyethyl groups per glucose unit is defined as the molar substitution ratio. Why do we care about these numbers? Larger molecular weight particles have a longer half-life which is desired, but with higher molar substitution comes an increased risk of coagulopathy (according to platelet function assays and thromboelastography). While colloids have beneficial properties, there are a few cautionary notes. Colloids in general are not a good choice for interstitial rehydration. Large volumes may interfere with platelet function. It is uncertain what the safe maximum dose is per day. Extrapolating from human guidelines, it is safest to not go beyond 40 ml/kg/day. Large volumes may cause refractometer reading to falsely approach the total solids of the colloid being used (E.g. Hetastarch = 4.2). Since colloids have a high COP and stay mostly within the intravascular space, patients on colloids must be monitored for volume overload. Remember that COP is the primary determinant of oncotic strength. The following table outlines some common fluid types in practice in its COP and osmolarity. Interestingly, packed red blood cells have a very low COP, but since the RBCs stay mostly within the intravascular space, it is treated like a colloid in terms of dose and duration of administration. Patients receiving blood products are at risk for volume overload the same as when using other colloids. There are many routes of administration to consider when formulating a fluid therapy plan. Oral administration is certainly the most physiologically normal. If there is no contraindication to oral intake, large volumes can be effectively administered and hypertonic and calorie dense fluids can be given safely. Unfortunately the oral route is not good for rapid volume expansion and is not recommended as sole use of rehydration if GI dysfunction is present. 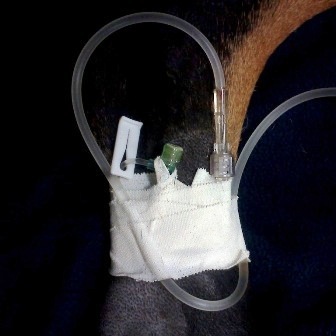 Subcutaneous fluid administration is convenient, inexpensive and useful for at-home therapy. The volume tolerated is dependent on SQ elasticity. It is less effective for large dogs as not enough volume can be easily given. 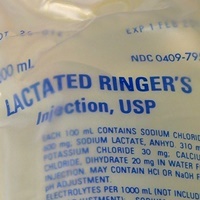 Only isotonic, non-dextrose containing fluids are recommended safe for use of this route. Intravenous is the preferred method of fluid administration. The choice of peripheral or central venous placement is guided by the number and type of fluids needed. Nearly any type of fluid can be given through a peripheral catheter. In general, the osmolality of the fluid being delivered should be iso-osmolar so as not to induce phlebitis. This being said, short infusions of hyperosmolar solutions can be given safely. From a practical perspective, fluids containing more than 5% dextrose should not be delivered through a peripheral vein for long term infusions. Solutions with an osmolality less than 550 mOsm/L are safe to deliver through a peripheral vein. Central veins tolerate higher osmolality fluids such as parenteral nutrition. Intraosseus administration is ideal for young or small/exotic animals. Sites include: tibial tuberosity, trochanteric fossa of the femur, wing of ilium, and greater tubercle of humerus. The advantage of an IO catheter is that ANY fluid, including blood products, can be delivered. The disadvantages include patient discomfort and catheter maintenance. How fast fluids can be run in is dependent upon the variables in Poiseulle’s law where Q is flow, P is the pressure gradient on either side of the catheter, r is the radius of the tube (catheter), n is the viscosity of the fluid going through the tube and l is the length of the tube. In practical terms, a short, large bore catheter most effectively delivers fluids. 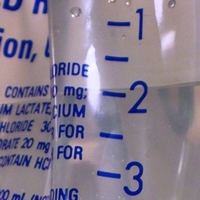 How quickly fluids should be administered depends on a few patient factors. Cats tend to be less tolerant of high volumes of fluids compared to dogs. Moderate to severely hypothermic patients do not have the normal vasomotor tone or cardiac contractility to be able to tolerate boluses or high rates of fluids. The presence of heart disease puts the patient at higher risk for volume overload or failure. Pediatric patients have higher fluid requirements (70-80 ml/kg/day), which should be taken into consideration when formulating a fluid plan. Fluid type considerations include whether the fluid is a crystalloid, colloid or hypertonic solution. Each of these has a safe administration dose and administration duration. The last consideration is your fluid therapy goal: Interstitial hydration or intravascular volume expansion? The hydration deficit calculation is helpful in determining the volume of fluid that should be given to achieve rehydration. We try to achieve rehydration within 12-24 hours safely. Likewise, the free water deficit calculation is helpful in determining the amount of free water needed to achieve intracellular rehydration. Unlike interstitial rehydration, intracellular rehydration should be done no faster than to achieve a 0.5 mEq/hr reduction in Na+. A bolus should be considered when rapid volume expansion is desired. By definition, a bolus is RAPID delivery of fluids (e.g., over 10-20 minutes). Unfortunately because of how quickly crystalloids redistribute, a 1 L bolus set to 999 on a fluid pump is not a bolus. Fluids in anesthesia. For routine surgeries, it is tempting to not want to place a patient on fluids. However, there are some preoperative conditions to consider: PCV > 50%, geriatric patient, azotemic patient. Even if the patient is well hydrated prior to surgery, there are surgical conditions to consider. Open abdominal surgery results in evaporative fluid loss and third spacing from inflammatory infiltrates post operatively. Evaporative loss is likely less of a concern in elective orthopedic surgeries. Many induction drugs are cardiovascular depressants, and gas anesthetics cause vasodilation. Common anesthetic fluid strategies include 10 ml/kg/hr or 10 ml/kg for the first hour, then 5 ml/kg. The latter would be considered for elective orthopedic surgery on a well-hydrated patient where there is little evaporative loss from the surgical site. Fluids in CPR. It is tempting to give shock doses of fluids to a patient that is in cardiac arrest. However, large volumes of fluid may not be necessary and could be detrimental if the patient survives. Manual chest compressions achieve a cardiac output that is only 20% of normal. And once the patient recovers they could suffer from temporary systolic dysfunction. Renal function is also impaired resulting in improper handling of fluids. Thus, large volumes of fluid administered during CPR may lead to volume overload and failure. A practical approach is to have fluids running at a low rate (slow drip) as opposed to wide open during CPR. An initial bolus should be considered if trauma or hypovolemia is a contributing factor to the arrest. Fluids in CHF. The hormonal influence of the rennin-angiotensin-aldosterone system on CHF is too complex a topic to cover in this article. There is undoubtedly an important role that RAAS plays in fluid retention and electrolyte handling in a chronic CHF patient. And the answer to fluid therapy in a cardiac patient is as complex as the pathophysiology itself. A patient with well-compensated disease will likely be less affected by RAAS. A balanced crystalloid would be most appropriate for rehydration of these patients. However, when a patient with a history of decompensation requires fluid therapy, we are more concerned about hormonal influence over Na+ handling. In this instance, a hypotonic fluid or a balanced crystalloid would be appropriate. However, hypotonic fluids are still not appropriate for boluses. Fluids and Transfusions. Any citrate containing blood product should not be run through the same line as calcium containing fluid (LRS). If the PCV of the packed RBC unit is <70%, it does not need to be diluted with NaCl. PCV of most units can range 60-80%. The theoretic risk of delivering a unit with a high PCV have a high viscosity and cause problems in the line resulting in cell lysis. The recommended dose and rate of administration of blood products is generally 10-20ml/kg over four hours. However, this should be tailored to the patient’s needs and lower doses should be used in cats. Hypertonic saline has a high tonicity resulting in a fluid shift from the interstitium into the intravascular space for rapid volume expansion. The advantages are that small volumes result in big effects, and it has been shown to increases cardiac contractility. However, when used alone the effect is very short lived, about 10-15 minutes. This effect increases to 45 minutes when “chased” with a colloid. Hypertonic fluid therapy is not appropriate for dehydrated patients, cardiac patients, renal patients or those who are already hypernatremic. It is best utilized in the resuscitation for acute volume loss of a previously euvolemic patient (e.g., hit by car or hemoabdomen). Other potential uses would include resuscitation of a patient that has pulmonary contusions where large volumes of fluid may exacerbate already leaky capillaries in the lungs. The dose for hypertonic saline is 3-5 ml/kg bolus over 10-20 minutes, followed by 3 ml/kg bolus of colloid for longest lasting effect. It is not to be given faster than 1-2 ml/kg/min as this may result in bronchoconstriction and bradycardia. At the clinic I work at, fluid therapy is one of the major things that we do before surgeries. Knowing about how and when to give them are going to be a huge part of my job for as long as I work in a clinic.